I went into the kitchen to quickly whip up a couple of scrambled eggs for breakfast, look what I walked out with. Sometimes it pays to let your culinary mind wander in the kitchen. 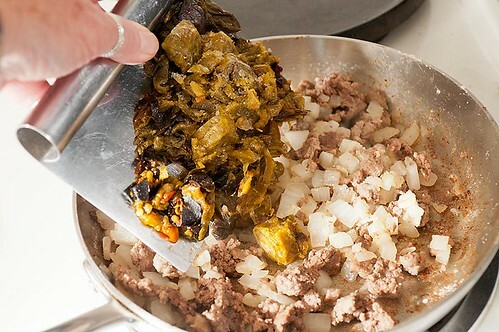 Back in the mid 60's, I learned this recipe (and many other cooking tips) from a nice old Mexican man. He was from the southern part of New Mexico, Capitan, to be exact. Since this was impromptu, I don't have a mise en place for you but I do have a recipe. 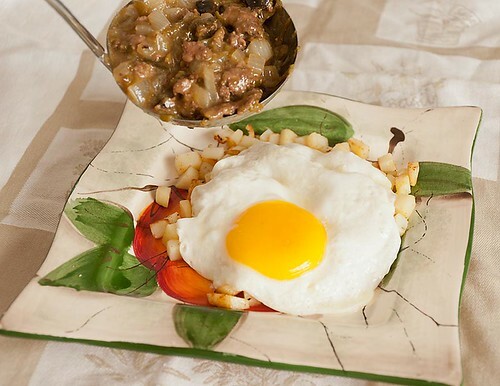 Brown ground beef and the diced onion together in a skillet. 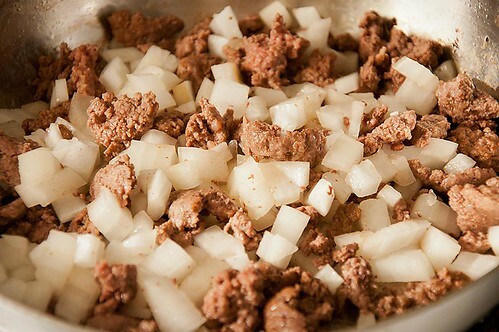 After the beef is browned and the onion translucent, add the garlic and cook for a few minutes more. 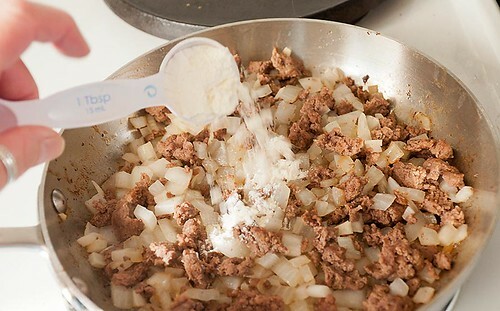 If you aren't using lean ground beef, drain off all but 1tablespoon of the fat before adding the flour. 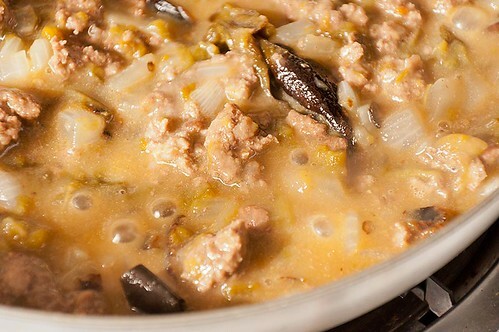 Sprinkle a tablespoon of flour over the beef mixture. Stir and cook for a few minutes to get rid of the raw flour taste. 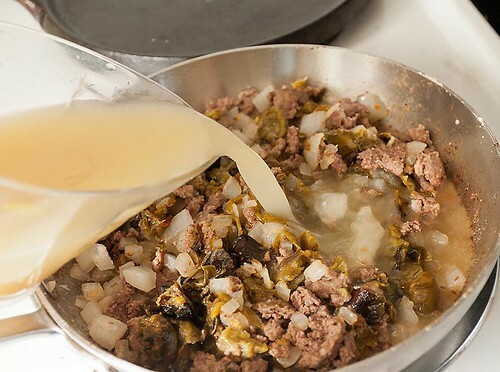 Mix the green chilis in with the beef mixture. and simmer until the sauce thickens. This is about the consistency I like my sauce. 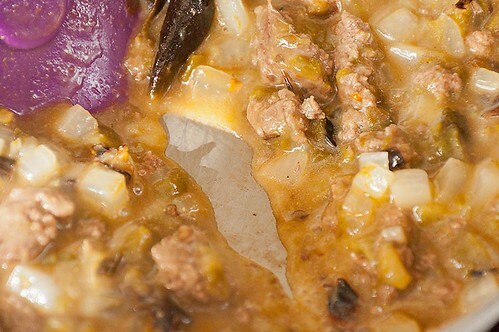 Just thick enough so that when a spatula is run through it, the sauce seperates and doesn't fill back in quickly. I can't imagine anything it's not good on, but eggs are at the top of my list. 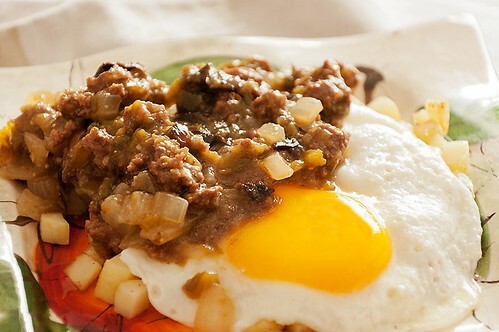 Humm, then french fries, quiche, burgers, or scoop some up with a corn tortilla, eat, be happy, repeat.